Bernie Sanders, angry and scolding as usual. Bernie is living the good life. Anyone who has read my articles knows I'm just sick of Bernie. This isn't because of policy disagreements, or lingering bitterness from the primary. I just think he's a thoroughly awful man. He has shown his deceitful, selfish and vindictive nature time and time again. I am stunned by how frequently I still hear people call Bernie “honest” or “authentic.” When I mention my arguments against Bernie to these people, I find they are often unfamiliar with the reality of the man and have this mental image of him as a stubbornly-principled saint. We do not have time for this fantasy. Bernie Sanders was a tremendously destructive force in American politics in 2016, continues to inflict damage on the Democratic Party, and has already begun making moves for a 2020 run. It is time for the public to have an open-eyed examination of the man's character, history, record and public statements. His television debut in this role was a stumbling mess. Pressed by Chuck Todd on whether Obama was a progressive , Sanders claimed he was, but refused to adjust his definition, even after being reminded that it excluded not just Obama but most Democrats . Sanders would ruffle more feathers a month later when he declared Clinton unqualified for the presidency due to her support for NAFTA, her Wall Street fundraising, and her Iraq War vote. Once again, when put in a sticky position he backtracked , only to later double down and triple down , even after it was pointed out to him that he was disqualifying most of his Democratic colleagues. Remember when Bernie wouldn't let Jon Ossoff be a progressive? Now you may be thinking, “This is why I like Bernie, he's the one pure guy, you know what he stands for.” But it's easy to stand alone and act pure while doing nothing. That doesn't make you a saint, it makes you Holden Caulfield. Despite giving the exact same stump speech for forty years , Bernie has not even attempted to accomplish anything with his power. Instead, he just introduces the same legislation every year, and makes no effort to pass it. As I pointed out in another article , the legislation Bernie introduces often isn't even real legislation?—?for the most part it's just rhetoric from his stump speech. When Bernie's Democratic colleagues won't pass his bogus legislation for him, he says it's proof of their corruption and corporate loyalties. These are the same Democrats who put together 59 votes for a public option , who voted 48–2 for McCain-Feingold , 54–0 for the Lilly Ledbetter Fair Pay Act , 53–2 for Dodd-Frank , and so on. This is the kind of real progressive change that Bernie, by every metric one of the most useless Senators , never even tries to pursue. What efforts for progressivism has Bernie made beyond rehashing his stump speech, both in person and in his legislation? By every indication, Bernie does not care about being effective in his job or working towards real change; he cares about looking pure and occupying the moral high ground. An oft-cited praise of Sanders is that he stands by his convictions. Bernie's convictions, however, were easy to stand by for most of his career because they were never seriously challenged. In the 2016 campaign, it became politically expedient to go back on his word, and he didn't think twice. Several cases of glaring hypocrisy reveal a fundamental dishonesty that I see in Bernie Sanders. Sanders' attacks on superdelegates were a core part of his campaign. He claimed their existence was proof of a Democratic conspiracy against him and that they were stealing his rightful nomination. Yet as his chances of beating Clinton in pledged delegates dwindled to zero, Bernie began executing a strategy of convincing superdelegates to swing the election in his favor . As the situation got more desperate, Bernie added another layer of hypocrisy by saying that superdelegates in states he won should vote for their state's winner, but those in states he lost should vote for “the strongest nominee.” Bernie was happy to rail against superdelegates for a year, but as soon as it was politically convenient, his conviction collapsed like a snowman in the sun. Bernie has also repeatedly demanded Trump release his tax returns; however, he has refused to release his, and has flat-out lied when pressed on the subject. Bernie's initial justification was that his wife was still doing them , and that she was looking through his closets to find the ones from previous years . That was over year ago and although Jane must have finished them by now, he still to this day refuses to release them. Instead, Bernie and Jane have repeatedly tried to lie that they've already released the returns . I won't speculate on what he's trying to hide, but it is brazenly hypocritical and deceitful for him to attack Trump on tax returns while repeatedly lying to avoid releasing his own. Bernie made opposition to Super PACs a core focus of his campaign. It may surprise you, then, to learn that Bernie was supported by a massive Super PAC. National Nurses United for Patient Protection, a federally registered Super PAC, spent millions of dollars supporting Bernie . Bernie frequently praised their efforts on his behalf and even used their volunteers at polling places and rallies. The Super PAC's spokesman gave the astoundingly lame excuse that they're not really a Super PAC because they're not billionaires . And lest you think this was just a group of nurses who loved Bernie, it should also be noted that “National Nurses United” is a well-funded, highly controversial operation that functions more as a disruptive political machine than a voice for nurses' interests, to the chagrin of the nurses it claims to represent. Its leader, RoseAnn DeMoro, would later support Jill Stein for president. Sanders has claimed that unlimited spending from Super PACs corrupts politicians by compromising their interests. He was supported by millions of dollars from an enormous Super PAC. Should we not, by his standards, consider him compromised, and be skeptical of all his health care statements? What would he say if it was Hillary? Bernie loves to have it both ways. A perfect example of this is his oft-repeated claim of having run a clean, policy-focused campaign. While often remembered through rose-tinted glasses as “hard-fought” but ultimately “issues-oriented”, the 2016 primary was in fact characterized by Hillary Clinton's long slog through an endless swamp of vicious, slanderous, deeply personal attacks by Bernie Sanders. Let's be very clear here. Instead of drawing a policy difference with Hillary Clinton, Bernie is essentially saying “yeah, Hillary has policies, but we know she's lying about them, because she raised money on Wall Street so she must be corrupt.” You can debate the veracity of that claim all you want, but that is NOT a policy difference. It is the dictionary definition of a personal attack. Bernie would repeat this and similar attacks countless times over the course of the campaign. Make no mistake, these are legitimate attacks on Clinton, but they do contradict Sanders' pledge to avoid personal attacks and character assassination. Sanders cannot regularly suggest that Clinton is bought and sold by corporate, moneyed interests and then say he's running a campaign on the issues. He's openly attacking her integrity. In a recent TV interview, Sanders even went after what he called the “corporate media” for not covering the issues he cares about, because, he said, mainstream journalists are taking cues from their corporate paymasters. In Sanders' world, everyone but him and his supporters are tainted. Top Sanders aides admit that it's been weeks, if not months, since they themselves realized he wasn't going to win, and they've been operating with a Trump's-got-no-real-shot safety net. You would think he'd at least mellow out in the waning days of his campaign. Instead, he opened fire. On June 5, two days before the final state primary in California, Bernie accused Clinton of being bribed by foreign governments through the Clinton foundation . You may remember this attack as a Trump favorite in the general election. Clinton's final victory was imminent and obvious, so let's ask ourselves, what did Bernie gain by handing Trump this gift-wrapped, Sanders-approved attack? Strategically he gained nothing; however, Bernie's true concern at this point was not winning the race but extracting concessions from the DNC. The final days of Bernie's campaign were characterized by a familiar pattern to anyone who was ever bullied in elementary school. He would use his supporters to threaten the Democratic Party and demand concessions. Then, after getting his concessions, he'd wait a few days for everyone to forget before going on TV to whip up his army against the DNC and demand more. For the most part the DNC gave him everything he wanted, yet there he was, a month after the primaries ended, declaring he would win in a contested convention. By early afternoon, Sanders allies were openly discussing plans to challenge Clinton's selection of Tim Kaine as her running mate. Remember #DemExit and Bernie Or Bust? Remember Bernie using these people as a blackmail weapon to bully the DNC? Particularly revolting to me is the way that he stoked these flames. Bernie was given the privilege of shaping the political worldview of millions of bright, young, open-minded first-time voters. He chose to use his power to convince them of a simplistic, poisonous worldview. It goes a little like this: the vast majority of America actually agrees with Bernie's radical policies, but millionaires and billionaires have bribed our entire government, as well as the DNC, into doing everything they can stop true progressive ideas. 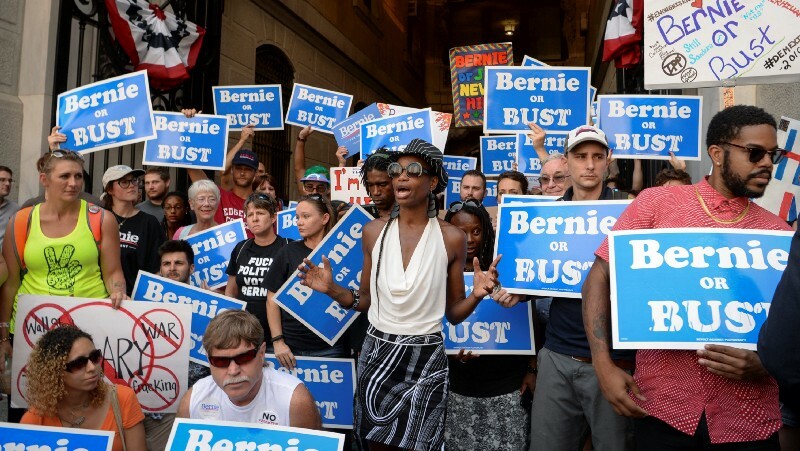 So many young progressives, once inspired by Bernie, were convinced by him to see corruption and conspiracy behind every corner, to wallow in apathy and anti-establishment helplessness. If you were a Republican trying to destroy the future of the Democratic Party, you couldn't have crafted a better strategy than Bernie's. But as long as he was getting what he wanted, he didn't care. Maybe he thought it wouldn't matter because he had that “Trump's-got-no-real-shot safety net.” How'd that work out? On March 15, five huge primaries billed as “do or die” for the Democratic race unfolded. Hillary Clinton won all five. In the remaining months, contest after contest would be desperately set up by the Sanders campaign as the new do-or-die, only for Clinton to destroy him again and again, all the way until the bitter end in California. If you only listened to Bernie during the primary, though, you would have seen a completely different race. In April, for instance, he was touting insignificant wins in Alaska, Idaho and Utah as evidence that he had a “path to victory.” As the losses piled up?—?New York, Pennsylvania and California in particular were all states his campaign promoted as “turning points” before he got crushed in them?—?he continued to promise an imminent victory. Even after the primaries had ended, he demanded that superdelegates supporting Clinton flip to him to help him overcome her pledged delegate lead… and promoted this strategy to his supporters as a viable path to victory. When even that fell through, he still insisted as late as July that he could win in a contested convention, refusing to concede the race until July 12 , over a month after the final contest. Let me give a special thanks to the financial support we received from students struggling to repay their college loans, from seniors and disabled vets on Social Security, from workers earning starvation wages and even from people who were unemployed. Let me remind you that Bernie has a history of funneling campaign money to his wife , and that Tad Devine was cashing in to the tune of $810,000 a month . Does dragging a lost cause on for four pointless months, using false promises of victory to extract money from “struggling students”, “seniors on Social Security” and “workers earning starvation wages”, seem like something an honest man would do? Bernie Sanders has spent a lifetime trashing the Democratic Party. He once declared that a JFK speech made him sick and opened his eyes to the lies of liberalism. He has constantly repeated the lie that “both parties are exactly the same.” His first ever congressional race was him throwing a safe blue seat to a Republican by running as a spoiler. In spite of all this, the Democratic party has always been unfailingly gracious and supportive of him. In 2016, when he begrudgingly joined the party “for media coverage” , the Democrats accepted him without hesitation, giving him a platform and organizational support. How did Sanders repay this kindness? By constantly attacking DNC officials, siccing his rabid supporters on them when he needed a scapegoat for a loss, or if they refused to bend rules in his favor. As an example, he claimed the DNC was conspiring to sink his campaign because they wouldn't schedule extra debates for him. When they did schedule an extra debate for him in New York, he thanked them by insisting the DNC not be involved in the debate at all . A particularly infuriating episode occurred when Bernie's campaign managed to hack the DNC database and steal Hillary's valuable voter data . The DNC responded by locking Bernie's campaign out of the database, and he fired back with a lawsuit. Even after they let him back in, he continued to press the lawsuit for nearly five months , and used the story throughout the campaign as evidence of a grand DNC conspiracy. He never returned the stolen data. Bernie's favorite scapegoat was DNC chair Debbie Wasserman-Schultz. Already very unpopular with Democrats, DWS made a perfect target for Bernie's petty vengeance. Long before the WikiLeaks DNC hack, Bernie was committing significant resources to supporting her primary challenger, Tim Canova. A nobody with no real platform outside of a rabid hatred of Wasserman-Schultz, Canova is today most well known for aggressively pushing the Seth Rich conspiracy . Bernie now pretends that he's never heard of Canova , but back in the spring of 2016, Bernie took significant time and resources from his campaign to support him, purely as a “screw you” to Wasserman-Schultz. Canova was a flaming dumpster fire of a man, but Bernie happily used him to threaten and humiliate DWS, as revenge for her not caving to his bullying. What does this tell us about Bernie's character? Wikileaks didn't just haphazardly dump the information: It used its Twitter account to highlight emails that supposedly exposed a corrupt effort by the DNC to secure the presidential nomination for Clinton… emails highlighted by Wikileaks as evidence of corruption in fact show staffers getting guidance from attorneys on how to comply with campaign finance laws and spitballing ways to respond to attacks from Sanders on the integrity of the nomination process… Wikileaks's tweets conjured dark and menacing conspiracies, but these are not borne out by the emails themselves. Take the group's claim that the “DNC knew of Hillary paid troll factory attacking Sanders online.” The highlighted email isn't some secret communication laying out nefarious plots. It's a summary of a panel discussion on Fox News Sunday. The WikiLeaks email dump is a great Bernie Sanders case study. The floodgates broke a week before the convention, when Bernie was ostensibly trying to unify the party. His campaign knew full well that WikiLeaks was lying to create chaos. He could have made a powerful move for unity by pushing back against the “rigged primary” narrative. Instead, he did the exact opposite. Sanders stated “There's no question to my mind, and I think no question to any objective observer's mind, that the DNC was supporting Hillary Clinton.” His campaign manager added “The DNC, by its charter, is required to be neutral among the candidates. Clearly it was not.” You can find the rest of his campaign's reaction in this handy guide the GOP put together for his supporters . The Sanders campaign ultimately succeeded in plunging the convention into chaos and forcing Wasserman-Schultz to resign. Let's take a step and ask ourselves why, on the brink of the convention, Bernie Sanders chose to stoke the flames of WikiLeaks' lies? The answer is pretty obvious. Sanders wanted revenge against the Democratic Party, and in particular Wasserman-Schultz, for perceived slights during the campaign, and WikiLeaks proved a powerful ally. Party unity and the general election be damned, if the opportunity for revenge offered itself Bernie was going to take it. Bernie supporters would spend the general election citing WikiLeaks conspiracy theories, now with Bernie's personal stamp of approval, as their reason for hating the Democratic Party and not voting. For a week before the Democratic convention, the self-proclaimed savior of the Democrats was a puppet for the Trump-WikiLeaks axis. Bernie knew he was being used to push a lie, and played along to advance his own selfish goals. Was it was worth it? Someone should ask him. The WikiLeaks example follows a common pattern of interaction between Sanders and his supporters: His supporters would find some piece of evidence to hammer over and over as evidence of a grand conspiracy, then Bernie would repeat their complaints, but demur on the conspiracy itself. This had the effect of riling up his supporters by tacitly endorsing their conspiratorial charges. The Sanders Campaign spent its time either ignoring or profiting from the chaos it did much to create... these delegates became a way for the Sanders Campaign to seek the advantage of disruption at any particular moment while trying to disavow any responsibility for their actions even as it was ongoing… The most egregious instance of the Sanders Campaign inciting disruption?—?and yes, violence?—?came as the State Convention's Credentials Committee completed its work. Adam Gillette, part of National Delegate Operations Team for the official Sanders Campaign, drafted and arranged for a member of that committee to attempt to deliver an incendiary, inaccurate, and wholly unauthorized “minority report” charging that the Credentials Committee had fraudulently denied 64 Sanders delegates their eligibility. Sanders was pressed by Harry Reid to defuse the situation . Instead, he put out a press release blaming the Democrats and justifying his supporters' actions. Bernie to this day will insist that he does not bear responsibility for the unbelievably outrageous actions of his supporters throughout the campaign and up to this day, and his defenders will insist likewise. But where do we draw that line? Bernie was like a guy walking an attack dog, going up to innocent people and viciously berating them, then acting shocked and surprised when his dog attacked. Wouldn't Sanders, if he had integrity, make an effort to defuse the insanity that festers in his base? What really demonstrates his lack of character is that he loves taking responsibility for his supporters, but only when it suits his purposes. How often has Bernie bragged about creating and leading his “revolution”? How often has he bragged about the “enthusiasm” he inspired in his supporters? It's a classic example of trying to have it both ways. He demands full credit for the enthusiasm of his army— until someone points out that “enthusiasm” involves them chanting “lock her up” or “she's a liar” or “corporate whore” at his rallies while he watches silently , or creating the #DemExit movement in his name , or making “hit lists” for threatening superdelegates , or pushing Seth Rich and PizzaGate conspiracies about Clinton online. Then, suddenly, he shouldn't be held responsible. It is dishonest and cowardly for Bernie Sanders to demand praise for his movement while dodging responsibility for its dark side. Speaking of personal responsibility, Bernie's campaign got caught cheating again and again during the primary, and he would always deny culpability. I already talked about the time they hacked the DNC database to steal Hillary's voter data, but did you know his campaign staffers once dressed up as union workers to sneak into a union workplace and lobby for Sanders? Weaver, Sanders' campaign manager, says staffers did wear Culinary buttons to try to talk to workers, but did not misrepresent who they were. In other words, “they lied about who they were, BUT they didn't lie about who they were.” Classic Sanders. How about his campaign's long, rich history of faking endorsements? First it was the AARP and the League of Conservation Voters in Iowa. Then he put out an ad called “Endorsement” falsely claiming the endorsement of the Des Moines Register , which had actually endorsed Clinton. A week later, in New Hampshire, the Sanders campaign used the exact same “Endorsement” ad, but swapped the Register for the Nashua Telegraph and Valley News , which also did not endorse him. Then the campaign was forced to apologize for lying about being endorsed by the American Legion , which the Legion called “totally illegal.” How many “honest mistakes” does he get to make before we stop believing they're honest? Example of an illegal mailer from Bernie's campaign falsely implying the endorsement of the LCV, which had actually endorsed Clinton. Other sleazy shenanigans perpetrated by the Sanders campaign include stealing ballot boxes in Puerto Rico (and then complaining of fraud when the DNC wouldn't let them steal more), accumulating 639 pages of FEC complaints about illegal donations (including more than $10M that the campaign still simply refuses to account for), and inciting a riot by brazenly lying to supporters about DNC rules . If you're a Sanders defender, your line here is “this was the campaign, Bernie had no knowledge of any of this.” If so, let me ask you something. Do you hold Donald Trump to the same standard? When Trump says he had no knowledge of the efforts by his senior staffers to collude with Russia, do you think that's a good excuse? Or do you hold him responsible for the totally illegal dirty tricks of his campaign? Bernie should be held to a higher standard than Trump, not lower. After reading all this, maybe you're thinking “OK, he had some rough moments, but he still seems like a good guy personally.” Think about it a little bit though. Is Bernie Sanders someone you would want as your boss? Would you want him as a parent? As a friend? Bernie is famous for his stubbornness, his impatience, and his abrasive nature. These have become endearing qualities because people want to like him. We like the idea of a gruff old man with no time to waste mincing words, who pushes towards his dreams with no hesitation or compromise. But this is the media‘s portrayal of Bernie. Reality check, he's just a jerk. Sanders was always full of himself: pious, self-righteous and utterly humorless. Burdened by the cross of his socialist crusade, he was a scold whose counter-culture moralizing appealed to the state's liberal sensibilities as well as its conservatives... My most memorable encounter with Sanders was during an editorial board session…I suggested that he had a larger moral responsibility to the progressive movement. At which point he jumped out of his seat, told me to go f*** myself and stormed out. You may think “this is just one guy”, but we've seen this play out in public time and again . Bernie has terminated interviews over subjects such as his opposition to the Amber Alert system , his wife's meeting with Joe Arpaio , and the Nevada caucuses . He became incredibly condescending when flustered in an interview on California radio. He rudely cut off a Univision anchor to inform him that he didn't need to answer questions about foreign policy because he was “running for president of the United States. ” And that was all in public! Now I understand why we all wanted to like Bernie. It's nice to have a bully when he's fighting for you. It reminds me of when Keith Olbermann's show “Countdown” was all the rage during the second Bush term. We all knew Olbermann was a smug prick, but it was refreshing and satisfying to see someone give conservatism a taste of its own medicine, to punch the Bush administration and its media cronies in the face with nothing held back. Bernie is kind of the same way. For many on the left, it's cathartic to see a street fighter out there ferociously and unapologetically promoting progressive ideas. But let's not blind ourselves to who the man is, how he behaves, and how he treats the people around him. I'll leave it to you. Is Bernie just a kind-hearted grumpy grandpa? Has he fought tirelessly throughout his life for progressive causes? Is he a paragon of consistent, incorruptible moral virtue? Or is he actually a smug, lying, selfish jerk, who slanders his colleagues, viciously attacks the party, and scams his supporters, all to support a huge ego trip? A man who claims to only care about policy, but has made no effort in forty years to bring about real change? A man who sees his loyal fans as a weapon for revenge against his own allies? Bernie is already gearing up to do it all over again in 2020 . The time to act is now. I implore you to do everything you can to stop this awful man before it is too late.